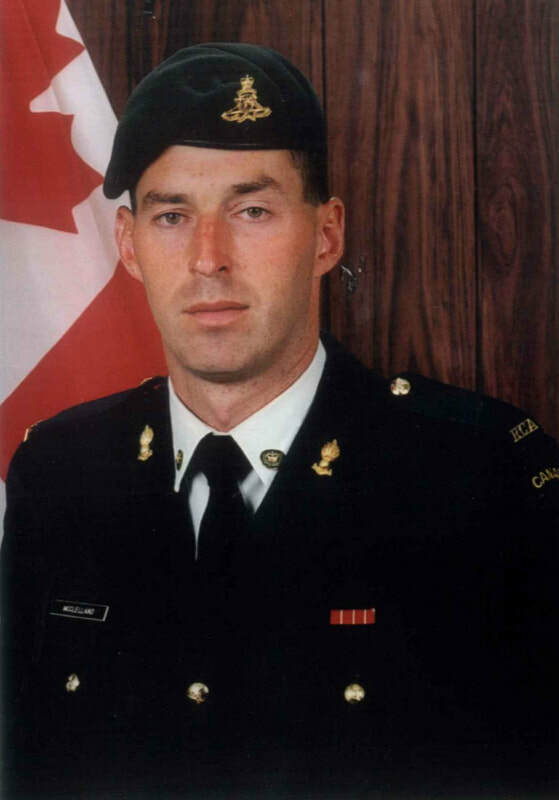 ​Taken on strength as a Gunner in 15th Field Artillery Regiment RCA on 25 Jan 1990, qualified General Military Training on 29 Apr 1990, qualified Artilleryman on 9 Feb 1991, qualified QL3 Crewman on 30 Apr 1992, qualified FMC Driver Wheeled on 15 Jun 1992, qualified Qualification Level 4 Communications on 17 Jul 1992, promoted Bombardier on 5 Nov 1992, operational deployment with United Nations Protection Force from Jan 1993 to Nov 1993, promoted Master Bombardier on 26 Mar 1997, promoted Sergeant on 11 Apr 1999, awarded the Most Proficient Detachment Commander trophy in 2000, Warrant Officer from 2008 to 2010, Master Warrant Officer from 2014 to 2016, promoted Chief Warrant Officer and appointed Regimental Sergeant Major 2018. 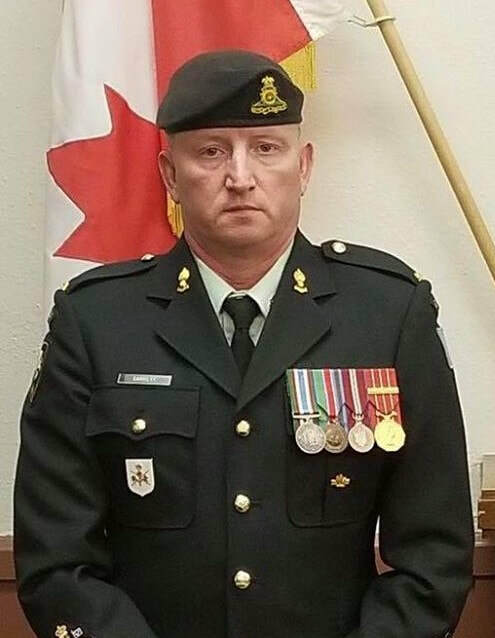 Taken on strength as a Gunner in 15th Field Artillery Regiment RCA in 1983, Gunner in 68 Battery in 1984, promoted Bombardier 1985, component transfers to Regular Force 1986, Gunner from 1986 to 1989, W Battery from 1986 to 1989, Sergeant from 1990 to 1999, 1st Regiment Royal Canadian Horse Artillery in 1990, Regular Force Cadre 15th Field Artillery Regiment RCA from 1991 to 1994, 2nd Regiment Royal Canadian Horse Artillery 1995 to 1999, Regular Force Support Staff 15th Field Regiment RCA from 2004 to 2005, component transfers to Primary Reserve in 2005, Master Warrant Officer 2005, promoted Chief Warrant Officer and appointed Regimental Sergeant Major 15th Field Artillery Regiment RCA 2013, commissioned Captain 2018. 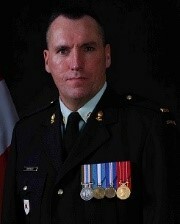 Corporal in 1984, Master Corporal from 1985 to 1990, Sergeant from 1999 to 2000, Warrant Officer from 2002 to 2004, Master Warrant Officer in 2005, promoted Chief Warrant Officer and appointed Regimental Sergeant Major 15th Field Artillery Regiment RCA in 2009, commissioned from the ranks to Captain in 2013. 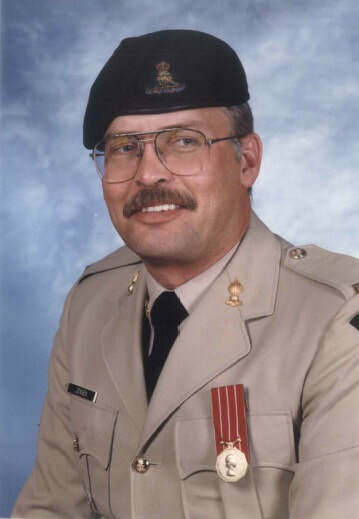 Taken on strength as a Gunner in 15th Field Artillery Regiment RCA 2 Apr 1987, qualified General Military Training 13 Jun 1987, qualified TQ1 Casualty Aide 31 Jul 1988, qualified TQ1 Artillery 11 Feb 1988, promoted Bombardier 2 Apr 1989, qualified Combat Leaders Course 8 Mar 1991, promoted Master Bombardier 9 May 1991, qualified QL4 Artillery Communications 7 May 1992, operational tour with UNFICYP 31 Jul 1992 to 16 Mar 1992, qualified QL4 Observation Post Technician 8 Mar 1993, qualified Artilleryman QL6A 23 Apr 1993, promoted Sergeant 28 Oct 1993, Qualified Senior Leaders Course 3 Nov 1995, qualified Machine Gun course 7 Jul 1995, attach posted to 1st Regiment Royal Canadian Horse Artillery 1995/1996, instructed at The Royal Canadian Artillery Battle School in 1996, awarded Dumoulin trophy for 1996, qualified Artillery QL6B Phase I, II & III 8 Aug 1997, promoted Warrant Officer 13 Sep 1997, promoted Master Warrant Officer 2 Mar 2003, promoted Chief Warrant Officer and appointed Regimental Sergeant Major from 2004 to 2009, appointed Brigade Sergeant Major from 2010 to 2013, commissioned from the Ranks as Captain in 2013, Operational Tour Afghanistan OP ATTENTION in 2013. 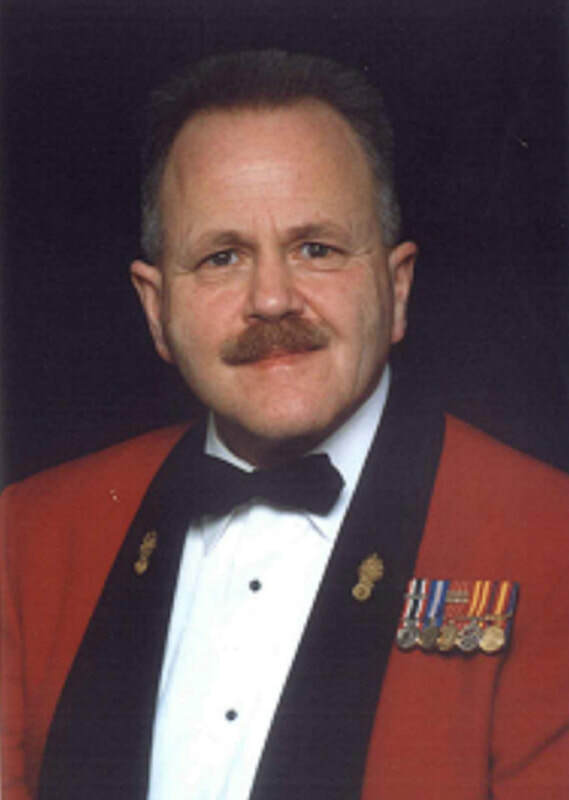 ​Taken on strength as a Gunner in 1970 in 15th Field Artillery Regiment RCA on 23 Apr 1969, qualified Artilleryman 021C on 11 Apr 1970, qualified Artillery Technician on 17 Jul 1970, qualified Advanced Artillery Training on 14 Aug 1970, qualified Junior NCO on 31 Dec 1970, promoted Bombardier on 1 Feb 1971, completed Senior NCO Course on 3 Nov 1974, participated on EX REFORGER in 1973 and 1974, qualified Senior NCO on 1 Aug 1975, promoted Sergeant 1 Dec 1975, qualified TQ2 Artillery Driver Wheeled on 23 Sep 1976, qualified Basic Combat Intelligence Course on 18 Nov 1976, qualified Advanced Artillery Technician on 12 Aug 1977, promoted Warrant Officer on 1 Apr 1978,qualified Master Warrant Officer on 21 Jul 1978, promoted Master Warrant Officer in 1982, transferred to Supplementary Ready Reserve on 16 Jun 1994, transferred to 15th Field Artillery Regiment RCA on 18 May 1999, promoted Chief Warrant Officer and appointed Regimental Sergeant Major from 1999 to 2004. 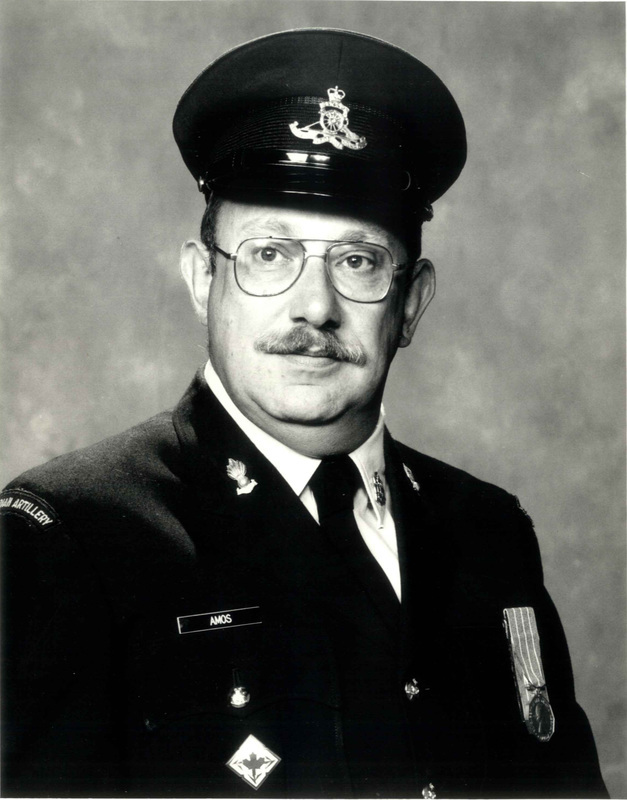 Taken on strength as a Gunner in 15th Field Artillery Regiment RCA on 28 Jan 1978, qualified General Military Training on 1 Nov 1980, qualified TQ1 Artilleryman on 27 Aug 1978, promoted Bombardier on 1 Feb 1979, qualified TQ2 Artillery Communications on 26 May 1979, qualified Driver Non-Trade on 18 Dec 1980, qualified Junior NCO Course on 27 Jun 1981, promoted Master Bombardier on 27 Jun 1981, qualified Senior NCO on 22 Oct 1982, qualified TQ3 Detachment Commander on 10 Nov 1982, promoted Sergeant on 13 Jan 1983, qualified TQ1 Supply Technician on 25 Jan 1984, qualified TQ2 supply Technician on 20 Jul 1984, awarded Dumoulin trophy for 1989, qualified Artillery Technician Part 1 (Recce) on 29 May 1993, qualified Artillery Technician Part 2 (CP) on 30 Jun 1993, qualified QL6B Artillery on 30 Jun 1994, promoted Master Warrant Officer on 1 Dec 1997, Acting Regimental Sergeant Major from 1998 to 1999, transferred to The British Columbia Dragoons on 7 Jun 2001. 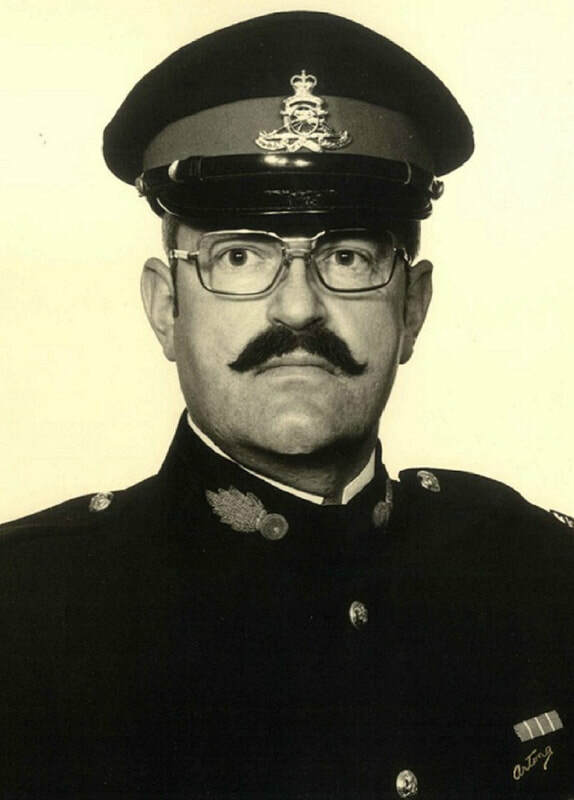 Taken on strength as a Gunner in 15th Field Artillery Regiment RCA on 16 Nov 1976, qualified General Military Training on 18 Jun 1977, qualified TQ1 Basic Artilleryman on 9 Apr 1978, promoted Bombardier on 1 Sep 1978, qualified Junior NCO Course on 27 Jul 1980, promoted Master Bombardier on 1 Sep 1980, qualified TQ2 Basic Artillery Technician on 4 Jan 1981, qualified Driver Non-Trade on 18 Dec 1980, qualified TQ3 Artillery on 12 Nov 1981, qualified Senior NCO on 22 Mar 1983, promoted Sergeant on 24 Mar 1983, qualified TQ4 Artillery on 8 Aug 1986, promoted Warrant Officer on 23 Apr 1987, qualified Master Warrant Officer on 29 Apr 1988, awarded Dumoulin Trophy for 1988, promoted Master Warrant Officer on 8 Dec 1988, qualified Combat Intelligence Course on 22 Mar 1989, appointed Regimental Sergeant Major from 1996 to 1997, transferred to Supplementary Ready Reserve on 4 Dec 1997. 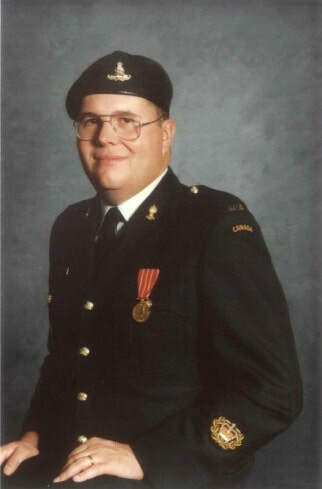 Enlisted Canadian Army as Soldier-Apprentice Shilo MB 23 Jun 1959, posted 2 Surface to Surface Missile Training battery Picton ON Sep 1961, posted 1 Surface to Surface Missile Battery Germany Jan 1963, posted 1 Locating Battery Winnipeg MB Sep 1966, promoted Bombardier 1 Oct 1966, posted 1st Regiment Royal Canadian Horse Artillery Jul 1968, posted Canadian Forces Recruiting Centre Victoria BC Sep 1974, promoted Sergeant 1 Sep 1974, Assistant Instructor Gunnery Course Gagetown NB Aug 1977, promoted Warrant Officer Sep 1977, posted School of Artillery Jun 1978, posted Canadian Forces Officer Candidate School Chilliwack BC Aug 1982, promoted Master Warrant Officer 27 Jun 1983, posted Regular Force Support Staff Pacific Vancouver BC Jul 1983, posted RSS Pacific HQ Pacific Militia Area Standards Jun 1986, served with PMA Headquarters Distribution Account Verification Team Jun 1987, component transfer to BC District Headquarters 15 Jul 1988, promoted Chief Warrant Officer on 20 Jul 1990, transferred to 15th Field Artillery Regiment RCA on 21 Oct 1991, appointed Regimental Sergeant Major on 14 Dec 1991, released 3 Oct 1996. 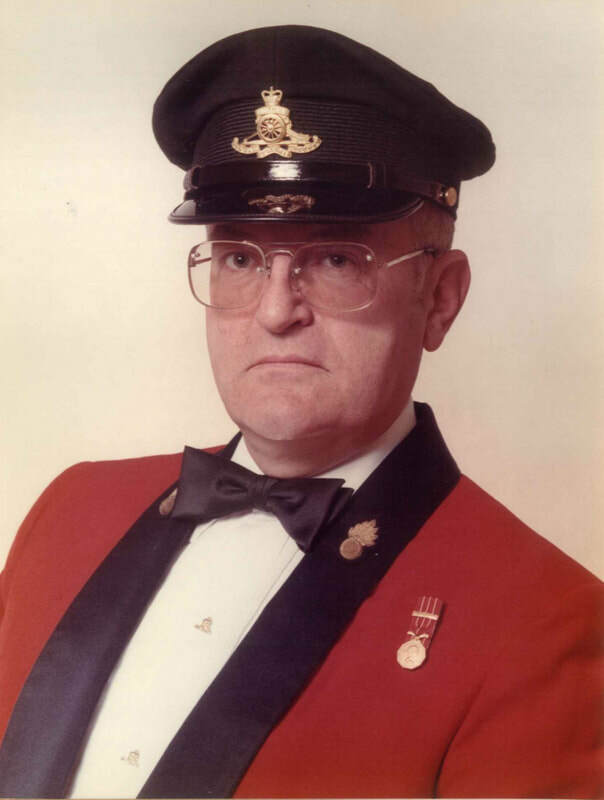 Taken on strength as a Gunner in 15th Field Artillery Regiment RCA on 3 Feb 1970, qualified General Military Training on 1 Jun 1970, qualified Musician R871C on 5 Sep 1972, promoted Bombardier on 1 Apr 1973, qualified Senior NCO Course on 17 Aug 1974, qualified Musician E1 on 24 Apr 1975, qualified Combat Leaders Course on 3 Nov 1974, promoted Sergeant on 1 May 1975, awarded Dumoulin Trophy for 1979, promoted Warrant Officer on 1 Jan 1981, qualified TQ2 Artillery Technician on 5 May 1981, qualified QL6B Musician on 1 Jan 1981, Change occupation to R021 Artillery on 1 Jul 1984, awarded Dumoulin Trophy for 1986, qualified Master Warrant Officer on 8 Jul 1988, promoted Master Warrant Officer on 10 Sep 1988, appointed Regimental Sergeant Major on 10 Sep 1988, released 13 Jun 1996. 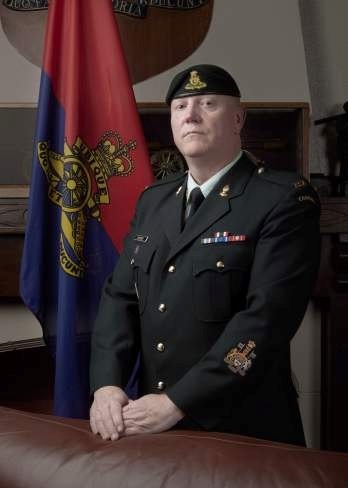 Taken on strength as a Gunner in 15th Field Artillery Regiment RCA 12 Nov 1970, qualified General Military Training 1 Jun 1971, qualified TQ1 Artilleryman 25 Mar 1972, qualified Junior NCO Course 25 Aug 1972, promoted Bombardier 1 Oct 1972, participated EX REFORGER 1973; qualified Senior NCO Part I 24 Nov 1973, qualified Senior NCO 2 Mar 1974, promoted Sergeant 1 Apr 1974, promoted Warrant Officer 1 Nov 1976, qualified TQ2 Artillery Communicator 2 Sep 1976, qualified TQ2 Artillery Driver Wheeled 23 Sep 1976, transferred to Supplementary List 22 Apr 1978, attach posted from Supplementary List 1 Jun 1979, cease attachment from Supplementary List 24 Apr 1982, transferred to 20th Field Artillery Regiment RCA 1982, promoted Master Warrant Officer, transferred to 15th Field Artillery Regiment RCA on 9 Aug 1983, promoted Chief Warrant Officer and appointed Regimental Sergeant Major 1 Apr 1986, awarded FMC Achievement Award 1 Jun 1987, transferred to Headquarters Militia Area Pacific 15 Sep 1988, commissioned Captain 24 Sep 1988, transferred to 15th Field Artillery Regiment RCA 1 Mar 1989, qualified Artillery ICT 24 Aug 1990, qualified Artillery ACT 24 Jun 1992, qualified Militia Officer Staff Course 5 Feb 1993, promoted Major 13 Oct 1993, Operational tour with UNPROFOR 1995, Operational tour with IFOR 1996, G1 BC Militia District 1996, promoted Lieutenant-Colonel and appointed Commanding Officer 15th Field Artillery Regiment RCA 24 Oct 1998, qualified Senior Officer Harassment Investigator on 29 Jun 2000, appointed Project Director Land Force Reserve Restructure 2004, promoted Colonel (WSE) 2004 and 2011; struck off strength 2013, elected President Royal Canadian Artillery Association Oct 2018, Employed in warehouse equipment industry as operations manager, sales representative and branch manager, Liberal candidate in 2015 federal election. 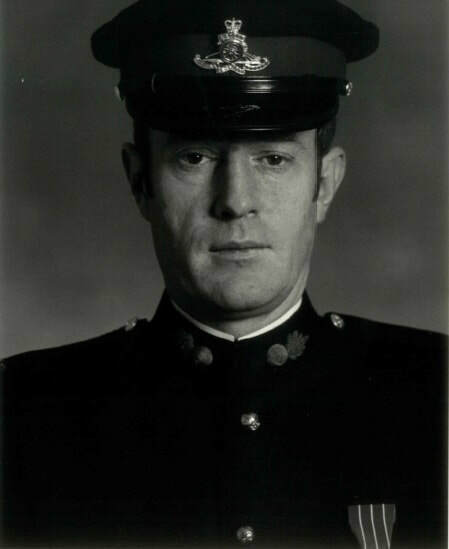 Taken on strength as a Cook Royal Canadian Service Corps allocated to 15 Field Artillery Regiment RCA on 19 Mar 1968, remustered from Cook to Artilleryman on 18 Apr 1969, qualified Junior Non-Commissioned Officer on 5 Apr 1970, promoted Bombardier on 1 May 1970, promoted Sergeant on 1 Sep 1971, promoted Warrant Officer on 1 Oct 1974, promoted Master Warrant Officer 1 Jan 1976, qualified Artillery Driver Wheeled on 23 Sep 1976, awarded the Dumoulin Trophy for 1980, promoted Chief Warrant Officer and appointed Regimental Sergeant Major 15th Field Artillery Regiment RCA on 15 Jun 1983, commissioned Captain on 25 Jul 1986, released on 31 Jan 1994, deceased 19 Jun 2016. 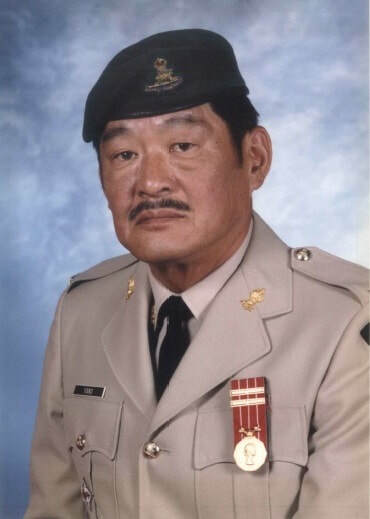 Taken on strength as a Gunner in 15th Field Artillery Regiment RCA on 5 Oct 1961, Lance Bombardier in 1962, Bombardier in 1963, Sergeant in 1966, Master Warrant Officer from 1969 to 1973, promoted Chief Warrant Officer and appointed Regimental Sergeant Major in 1976, appointed District Sergeant Major in 1979, transferred to 15th Field Artillery Regiment RCA on 1 Sep 1981, appointed Regimental Sergeant Major on 1 Sep 1981, transferred to Supplementary List on 15 Jun 1983, commissioned as a Captain with the Cadet Instructor Cadre from 1988 to 1999, deceased 29 Jul 2018. 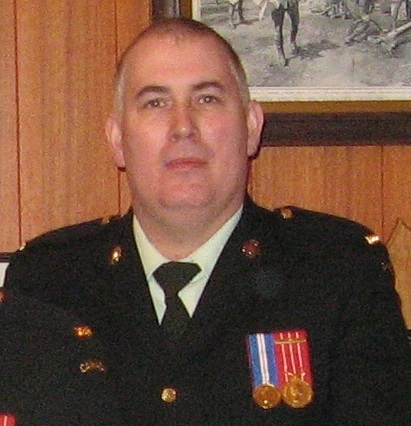 Taken on strength as a Gunner in 15th Field Artillery Regiment RCA on 18 Jan 1968, qualified General Military Training on 10 Dec 1968, qualified 0021 Artilleryman (M) on 16 Mar 1969, qualified Junior NCO on 5 Apr 1970, promoted Bombardier on 1 May 1970, completed Senior NCO part I on 7 Feb 1971, qualified Senior NCO on 27 Mar 1972, promoted Sergeant on 1 Apr 1972, promoted Warrant Officer on 1 Oct 1974, qualified TQ2 Artillery Driver Wheeled on 23 Sep 1976, qualified TQ2 Basic Artillery Technician on 2 Sep 1976, qualified Safety Officer on 30 Oct 1977, qualified Master Warrant Officer on 27 Jul 1978, promoted Master Warrant Officer on 1 Sep 1978, promoted Chief Warrant Officer and appointed Regimental Sergeant Major on 19 Jan 1980, commissioned Acting Captain on 5 Nov 1981, released on 26 Jan 1985, deceased 27 January 1988. 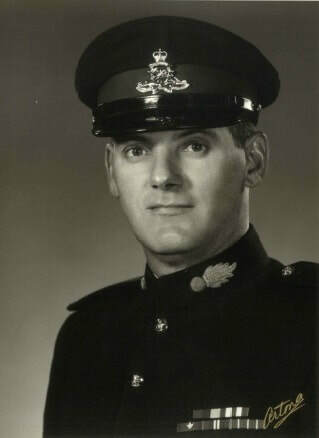 Taken on strength 6th Field Regiment RCA on 6 Oct 1958, transferred to 7th Battery 34th Field Regiment RCA in Montreal in September 1960, transferred to 158 Battery 15th Field Artillery Regiment RCA in September 1966 in the rank of Sergeant; qualified artillery technician on 26 Nov 1968, promoted Master Warrant Officer on 1 Apr 1968, Battery Sergeant Major 68 Battery in 1969, promoted Chief Warrant Officer and appointed Regimental Sergeant Major 15th Field Artillery Regiment RCA on 1 Sep 1972, transferred to Supplementary List effective 24 Dec 1976. 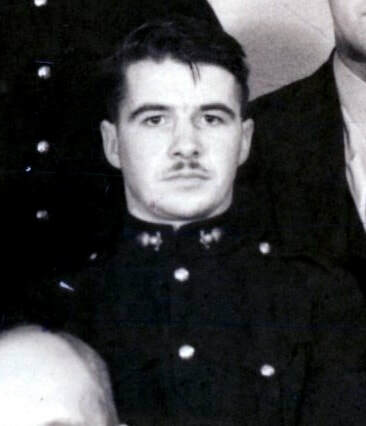 British National Fire Service from 1944 to 1946, Royal Air Force from 1947 to 1949, Royal Air Force Volunteer Reserve from 1949 to 1957, 8th Technical Regiment, Royal Canadian Electrical Mechanical Engineers from 1958, Warrant Officer Class II from 1966 to 1968, Chief Warrant Officer and Regimental Sergeant Major 15th Field Artillery Regiment RCA from 1969 to 1972, struck off strength 1972, deceased 20 June 2003. 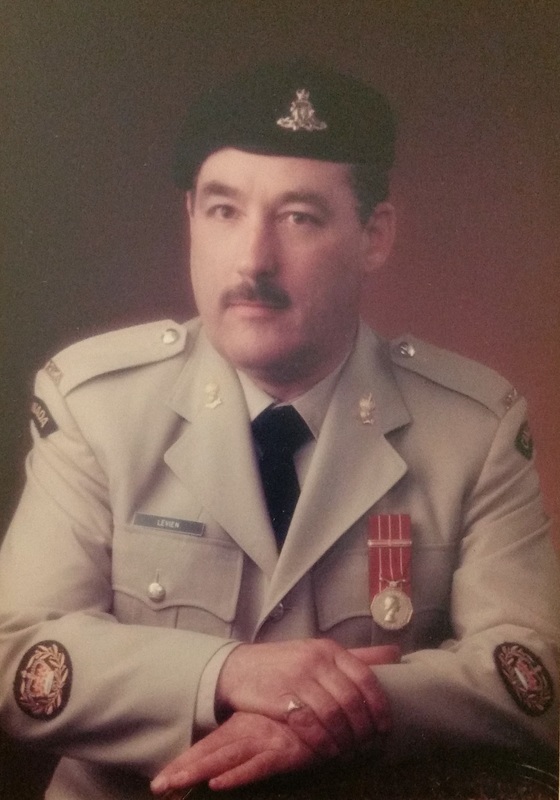 Warrant Officer Class II in 1966, Warrant Officer Class I and Regimental Sergeant Major 15th Field Artillery Regiment, RCA ​from 1966 to 1969, Cadet Instructor Cadre Lieutenant from 1976 to 1978. 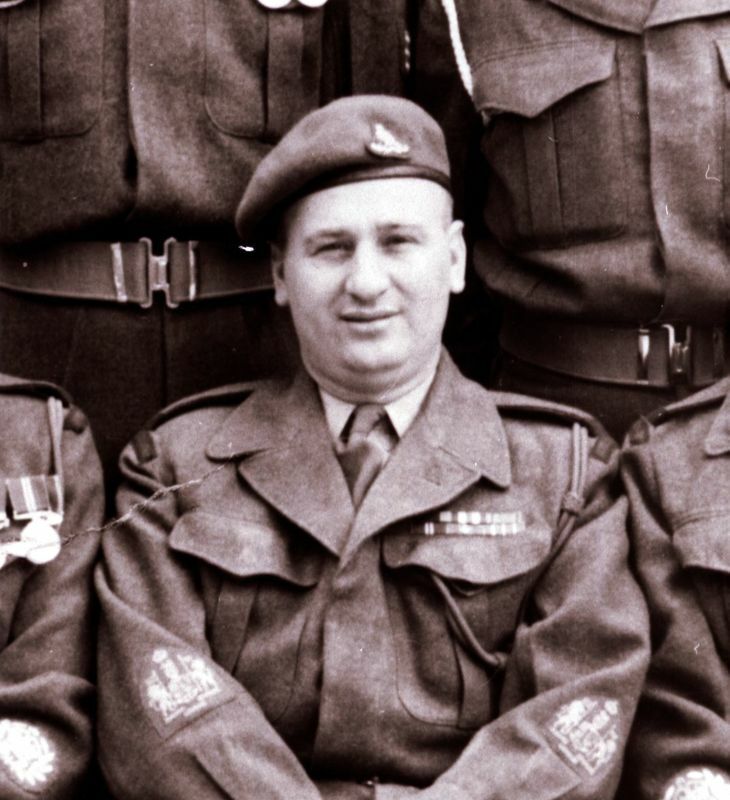 Taken on strength Seaforth Highlanders of Canada Canadian Active Service Force, struck off strength Active Service in 1947, taken on strength 102nd Coast Regiment RCA, appointed Regimental Sergeant Major 102nd Coast Regiment RCA, taken on strength 43rd Heavy Anti-Aircraft Regiment RCA in 1953, taken on strength 15th Field Regiment RCA on transfer from 43rd Heavy Anti-Aircraft Regiment RCA on 29 Mar 1955 as Acting Warrant Officer Class I, appointed Regimental Sergeant Major 29 Mar 1955, promoted substantive Warrant Officer Class I on 2 Jul 1955, stood down 1966, deceased 9 Mar 2001. 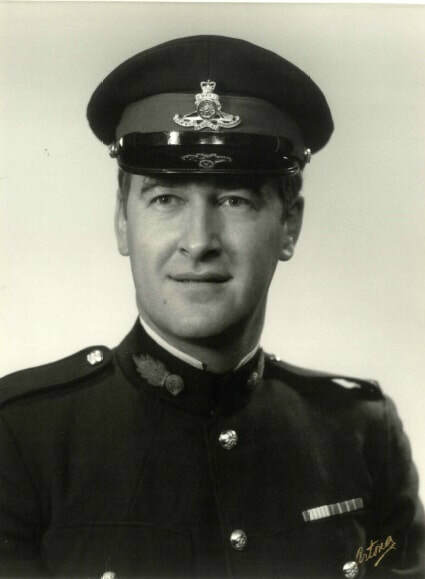 Taken on strength 43rd Heavy-Anti-Aircraft Regiment RCA, transferred to 15th Field Regiment RCA on 1 Jan 1953, appointed Acting Sergeant on 1 Jan 1953, appointed Acting Warrant Officer Class 1 and Regimental Sergeant Major on 1 Apr 1953, relinquished appointment of Regimental Sergeant Major on 26 Feb 1954, reverts to Gunner on 26 Feb 1954, struck off strength on 26 Feb 1954. 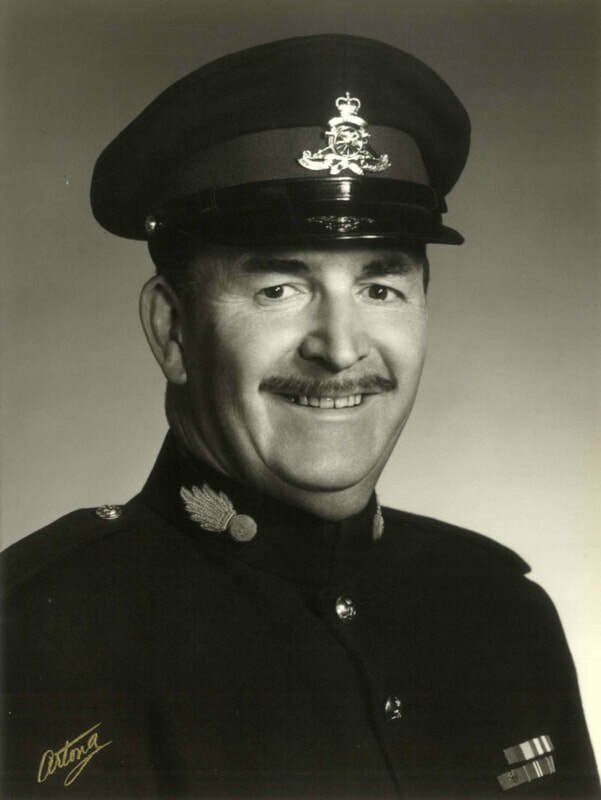 Taken on strength in 15th Field Regiment RCA on 21 Oct 1948, promoted Acting Sergeant on 21 Oct 1948, confirmed Sergeant on 28 Feb 1949, appointed Acting Warrant Officer Class II on 1 Mar 1949, confirmed Warrant Officer Class II on 23 Sep 1949, to be Acting Warrant Officer Class I and appointed Regimental Sergeant Major on 24 Sep 1949, relinquishes the appointment of Acting Warrant Officer Class I and Regimental Sergeant Major on 14 Feb 1952. 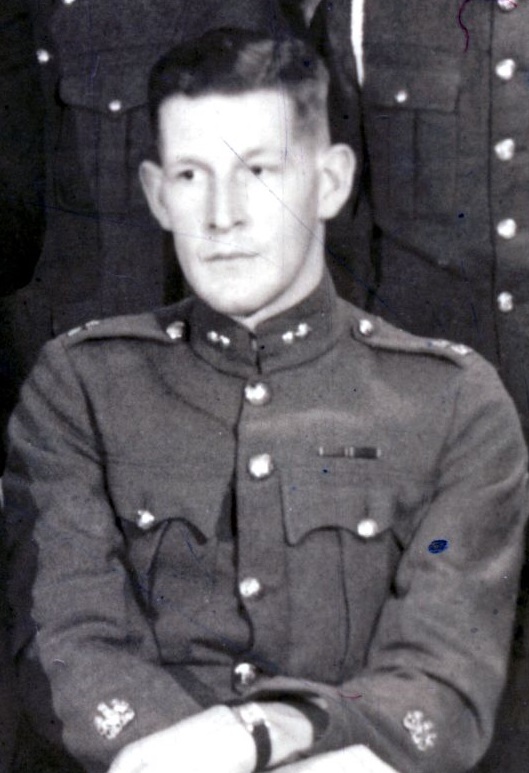 Taken on strength and posted to 201 Battery 11th (Reserve) Anti-Aircraft Regiment RCA 15 Apr 1946, assigned Regt # K415908, Appointed Acting Warrant Officer Class I and Regimental Sergeant Major of 43rd Heavy Anti-Aircraft Regiment RCA 1 Oct 1949 to 1959. 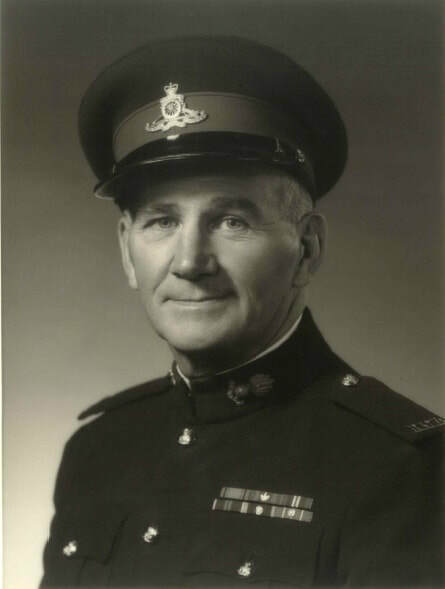 Served with Pacific Command Security Intelligence Section, made a member of the Military Division of the Most Excellent Order of the British Empire on 5 Jan 1946, taken on strength 15 Coast Regiment RCA on 4 Sep 1946, promoted Quartermaster Sergeant (Warrant Officer Class II) on 4 Sep 1946, promoted Warrant Officer Class I and appointed Regimental Sergeant Major of 15th Coast Regiment RCA on 28 Jan 1947, transferred to the 102nd Coast Regiment RCA on 23 Sep 1949, retired to Sechelt BC, deceased July 1982. Battery Sergeant Major 15th Field Brigade RCA 1937, taken on strength Canadian Active Service Regt #K25202, appointed Regimental Sergeant Major 6 Canadian Field Regiment RCA Sep 1939, struck off strength 6 Canadian Field Regiment RCA 13 Sep 1945, appointed Acting Warrant Officer Class I and Regimental Sergeant Major 11th (Reserve) Anti-Aircraft Regiment RCA 30 Apr 1946, assigned Regt #K415904, confirmed in the rank of Warrant Officer Class I 43rd Heavy Anti-Aircraft Regiment RCA 30 Apr 1947, struck off strength on release 30 Sep 1949, deceased 12 Jun 1986, buried Mountain View Cemetery Vancouver BC. 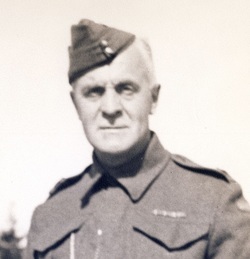 Taken on strength as a Gunner with 85th Battery 15th (Vancouver) Coast Regiment RCA NPAM on 2 Aug 1940, assigned regimental number V10414, to be Acting Battery Sergeant Major 15 Sep 1940, assigned new regimental number K417501, appointed Acting Regimental Sergeant Major 11th (Reserve) Anti-Aircraft Regiment RCA 1 Oct 1945, struck off strength 29 Apr 1946, deceased 28 Jun 1960, buried Masonic Cemetery of BC Burnaby BC. Enlisted Royal Artillery in India 1907, mobilized with 75th Battery Royal Field Artillery, served Western Front from 15 Jan 1915, transferred to Salonica 30 Sep 1915, in command of 85th Brigade Small Arms A.C. until Armistice, transferred to the Army of the Black Sea in Constantinople, served in 130th Brigade Royal Field Artillery for nearly 2 years, resigned commission in May 1920, emigrated to British Columbia 1924, Battery Sergeant Major 85th Howitzer Battery Canadian Field Artillery 1930, Warrant Officer Class II from 1931 to 1937, promoted Warrant Officer Class I and appointed Brigade Sergeant Major 15th (Vancouver) Coast Brigade, RCA on 1 Oct 1939, deceased 6 May 1946 due to carcinoma of pancreas, buried Mountainview Cemetery. 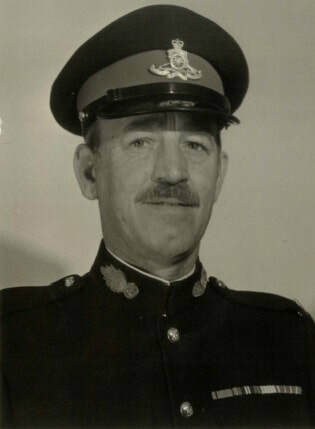 Taken on strength 15th Brigade Canadian Field Artillery 1924, Warrant Officer Class I and Brigade Sergeant Major 15th Field Brigade Royal Canadian Artillery 1933, awarded Kings Jubilee Medal 1935, awarded Canadian Efficiency Medal 8 Aug 1936, awarded Kings Coronation Medal 1937, Lieutenant Quartermaster 15th (Vancouver) Coast Brigade 26 Aug 1939, promoted Captain, transferred to Canadian Military Headquarters 21 Army Group United Kingdom 7 Aug 1942, promoted Major, assigned Port Major at Hook of Holland, discharged 19 Aug 1947, possibly deceased 1994 Barnstable/Devon/England. 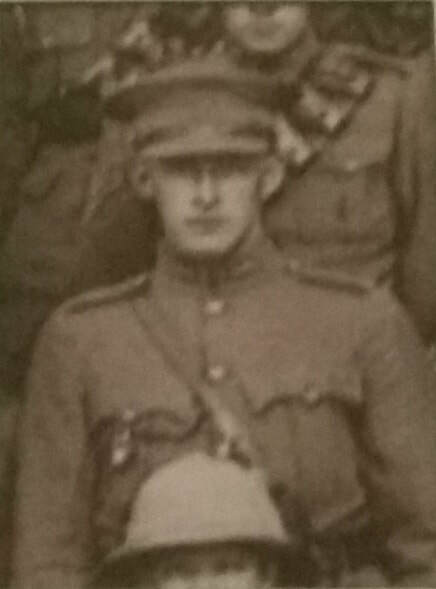 Taken on strength 68th Overseas Depot Battery on 21 Feb 1916, embarked Canada 28 Apr 1916, disembarked Liverpool 7 May 1916, transferred to Reserve Brigade 8 May 1916, appointed Acting Bombardier 17 May 1916, reverted to ranks at own request 1 Jul 1916, drafted to France with 4.5" Howitzer Brigade 5 Jul 1916, attached to 1st Canadian Divisional Artillery Column 8 Jul 1916, posted to 3rd Canadian Field Artillery Brigade 10 Jul 1916, sentenced 5 days field punishment No.1 leaving parade without permission 7 Dec 1916, awarded Military Medal for bravery in the field 18 Jul 1917, hospitalized on 25 Aug 1917 gunshot wound head, invalided to England 6 Sep 1917, taken on strength 2nd Brigade CFA 15 Nov 1917, proceeded to France 18 Mar 1918, promoted Bombardier 14 Sep 1918, promoted Corporal 13 Feb 1919, granted 14 days leave 26 Mar 1919, embarked for Canada 18 May 1919, discharged from HMS 27 May 1919, Warrant Officer Class I and Brigade Sergeant Major of 15th Field Brigade, Canadian Artillery from 1930 to 1933, deceased 28 Jun 1953, buried at Mountainview cemetery. 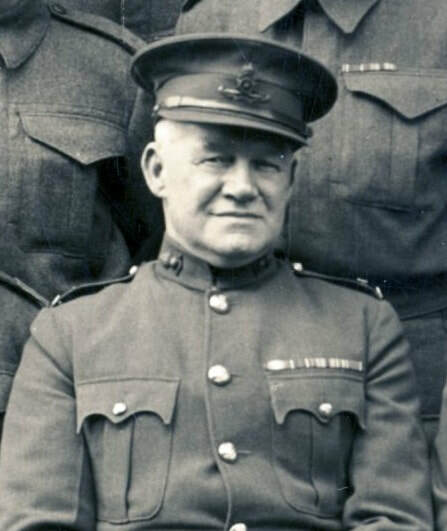 Born in Norway, emigrated to New Zealand, Captain in the New Zealand Mounted Rifles, attested into 68th Overseas Depot Battery 21 Feb 1916, arrived in England 22 Sep 1916, appointed Acting Battery Sergeant Major, appointed Acting Regimental Sergeant Major of 4th Division Ammunition Column 15 Jul 1916, appointed Acting Battery Sergeant Major Warrant officer 2nd Class 5th Canadian Divisional Artillery Column 22 Sep 1916, proceeded to France 21 Aug 1917, appointed Acting Regimental Sergeant Major 30 Non 1917, promoted Warrant officer Class I 8 Feb 1918, proceeded to England 11 May 1919, awarded Military Cross 3 Jun 1919, proceeded to Canada 12 Jun 1919, discharged from Canadian Expeditionary Force on 27 Jun 1919, promoted Warrant Officer Class I and appointed Brigade Sergeant Major 15th Field Brigade Canadian Artillery from 1924 to 1930, deceased 24 Apr 1956, buried Mountainview Cemetery. 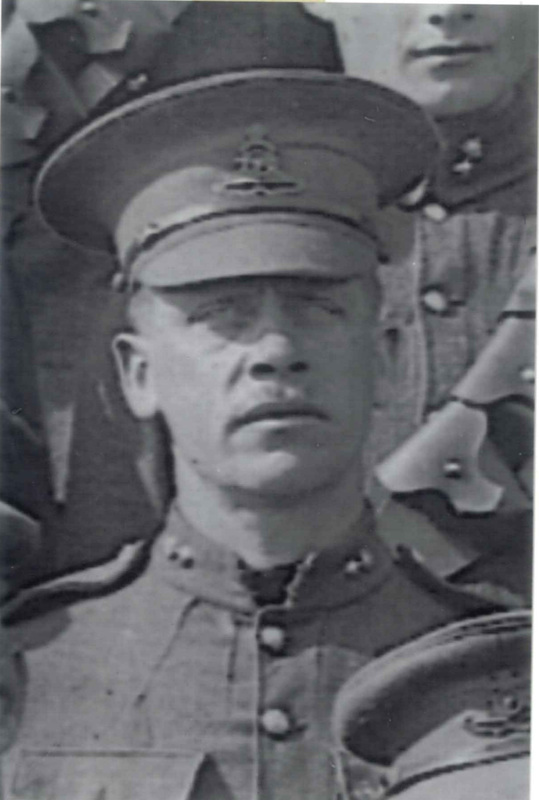 Royal Garrison Artillery and Royal Field Artillery for 13 years, attested into the Canadian Over-Sea Expeditionary Force on 14 Jun 1916, taken on strength 68 Depot Battery, promoted Bombardier 21 July 1916, promoted Corporal 14 Sep 1916, promoted Sergeant 11 Dec 1916, appointed Battery Sergeant Major Overseas Secion No. 11 Artillery Depot 23 Apr 1917, discharged in consequence of reduction of Military Forces 14 Dec 1918, Warrant Officer Class I and Brigade Sergeant 15th Brigade Canadian Field Artillery from 1921 to 1924, deceased 10 Feb 1969.